Maiden ticket prices have nearly doubled in the last 12 years, at least in Germany. In the UK too. When I first saw them in 2006 in Glasgow the face value of the ticket was £32.50, now it's £67 or similar. Aberdeen is a bit cheaper though as it's the shittest venue. Actual, non-scalping prices for the upcoming show here. Just when you thought the greed of KI$$ and $immon$ couldn't get any worse. I wish the public would stand up to this insanity and boycott this tour! 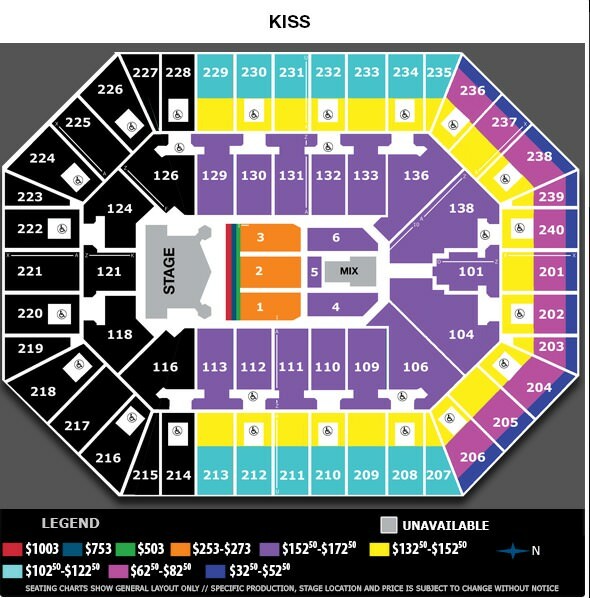 Lol there's a guy sitting at the end of the red sections a few feet away from guys in the purple sections in 129 and 113 and he's paying over $800 more! Singer is a talented bloke, surely he at least can be allowed to play live. Edit: Eric Singer as opposed to the singer. I didn't grow up with them but I can't deny there's a certain magnetism about everything KISS that I really like. They've put out some damn good albums too! Ace is in great shape, way better than during the first reunion. He would actually look better in the costume now I think. I'm really not sure whether we should expect Ace to come back. I don't know if I expect that to really boost sales all that much anyway. I'm noticing a lot of buzz with this tour from people who aren't normally into Kiss and definitely won't know/care about who is in the band. Ace definitely isn't a liability anymore and it's just one tour. So I guess it's more whether there's any financial benefit or if they want to end with this current lineup being the definitive one. Ace apparently just performed together with KISS on the KISS kruise, acoustic and not in makeup. I wonder if this is a sort of premonition that we can expect Ace on the upcoming tour or not. Yes, and they performed a couple of songs. Bruce Kulick was also there. Grabbed tickets today. $117 for nosebleed. I think Ace, Bruce Kullick and Vinnie (who recently performed his first concert in 20 years with Kiss make-up) will be the special guests. I do not know about Peter Criss, I think he is retired, but 3-4 songs wouldn't be hard for him. And I really hope they will do a tribute to the late great Eric Carr. Most recent news on Kiss: they rented out Los Angeles Forum Arena to check out the pyro for their farewell tour and reckons to end the concert with Rock And Roll All Nite, as always. Paul Stanley: ''I know that I will sound great on the farewell tour''. Forostar, Night Prowler, Mosh and 1 other person like this. I hope you're wrong, really. Otherwise that will be sad. I thought the sound for Maiden in Aberdeen this year was much better than that in Glasgow on the previous tour. If they play both venues again I'd definitely pick Aberdeen over Glasgow. It's more likely that was down to the new sound guy rather than the venue.